Light One Candle… Mary's Blog | "It's better to light one candle than to curse the darkness"
While I did not attend the Papal Mass in the Phoenix Park, I was at the three day Congress last week in the RDS which preceded the visit of Pope Francis. I found those three days inspiring and uplifting and it was a wonderful opportunity to meet and talk to so many people of faith from so many different parts of the world. I also got the opportunity to attend some of the sessions and discussions with the various speakers – the programme was so wide and varied that it was difficult to know what to attend and unfortunately some of the ones I was interested in were scheduled to run at the same time. This entry was posted in Uncategorized on August 31, 2018 by Mary Kirk. This entry was posted in Uncategorized on July 16, 2018 by Mary Kirk. 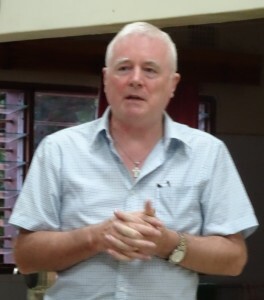 Two weeks ago I attended a three day training course in Thurles http://www.irishinstituteforpastoralstudies.com/ on something called “Godly Play”. I had no idea really what it was about but I had heard great things about it around the Dublin Diocese and felt it might be really useful as a more interesting way of connecting with children in the parish. I discussed it with my PP and he agreed that it sounded interesting and could be a great way of reaching out to children, and I know now can also be used with adults! This entry was posted in Uncategorized on July 14, 2018 by Mary Kirk. This Sunday’s Gospel is, like last weeks, another call to discipleship. Here we have Jesus inviting Simon, Andrew, James and John to follow him. This is preceded by Jesus commencing his ministry in Galilee, proclaiming that the Kingdom of God is near, and exhorting all to repent and believe his Good News. Obviously these four fishermen were bowled over by the message and they left everything “at once” and followed him. This entry was posted in Uncategorized on January 21, 2018 by Mary Kirk. This entry was posted in Uncategorized on January 6, 2018 by Mary Kirk. This entry was posted in Uncategorized on January 1, 2018 by Mary Kirk. I have come back to this blog after almost two years absence! I dont know why I stopped posting – I guess my time management skills were not so good! This entry was posted in Uncategorized on December 28, 2017 by Mary Kirk. This entry was posted in Uncategorized on November 12, 2016 by Mary Kirk. As we transition into the new year, let’s try an Examen prayer of our previous year. It’s really pretty simple: the Examen helps us reflect on a past period of time—usually we reflect prayerfully over the previous day or the previous few hours. But I believe we can apply these principles to the past calendar year as well. Step One: Become aware of God’s presence. One way of doing this is to ask the Holy Spirit to help you review the year with a holy perspective—with wisdom, grace, and faith. Ask for the grace to tear yourself away from your own patterns of thinking and seeing so that you can see your life more as God sees it. Of course you will see your failings—but God sees you as a beloved daughter or son who has a future and a hope. Of course you will see your accomplishments—but God sees your deeper self, the person behind all the activity, a person made in God’s image. Step Two: Review the year with gratitude. As you use this holy perspective to review the year, pay attention to the good gifts from the year ending. Name specifically those that come to memory now, and thank God for them. Step Three: Pay attention to your emotions. Think over the year again, and notice your emotional reactions. What memories speak most loudly to you? What events, conversations, relationships, or activities bring up the most emotion now, as you remember them? Ask God to help you linger with these emotions, whether they are pleasant or disturbing. Ask for help in understanding why you feel as you do. What can you learn about yourself or about your situation as you dwell in your emotional responses? Step Four: Choose one feature of the year and pray from it. While you are lingering with your memories and emotions, settle on one feature. Perhaps it is a single event, or maybe it’s a pattern of your own behavior that has come to mind as you reviewed the year. Whatever it is that has emerged, allow it to fuel your prayer. Don’t worry about the many other aspects of the year that you could think about right now; stay with the one thing that has come to you with the most power and pray from those thoughts and emotions. Step Five: Look toward the new year. Imagine what challenges and blessings might await you in the coming year. Think of important relationships, major (and minor) decisions to be made, skills to learn, habits to build, healing to seek, good work to accomplish. Make a simple list of highlights—matters that you expect to take prominence in your life in the new year. Bring them to God now, and ask for the graces you will need. End your prayer, thanking God for love and life and holy possibilities. Is New Years Day a big day for you? I suppose there is a sense of putting the past behind you, turning over a new leaf, or a clean page etc. I remember years ago when New Years eve was such a big deal – and, that evening, if you were not going out somewhere exciting with someone equally exciting you were just the most boring person around! If thats still the case well, I could win an award for it…. I dont go anywhere exciting but I do take the opportunity to review my life over the past year and think about the many things I have to be grateful for. Ask God for light. I want to look at my day with God’s eyes, not merely my own. Give thanks. The day I have just lived is a gift from God. Be grateful for it. Review the day. I carefully look back on the day just completed, being guided by the Holy Spirit. Face your shortcomings. I face up to what is wrong—in my life and in me. Look toward the day to come. I ask where I need God in the day to come. The other thing that struck me today is that every day is worth celebrating – not just New Year’s Day. Every day is a gift, a chance to do something special, make good things happen, celebrate the blessings and gifts and wonderful people in my life. Every morning brings me another 12 hours to make a difference and live with purpose. Thats something to celebrate! T.S. Elliot said in the Four Quartets, “[Human]kind cannot bear very much reality.” What humans often prefer are highly contrived ways of avoiding the real, the concrete, the physical. We fabricate artificial realities instead, one of which, I’m sad to say, is religion itself. So Jesus brought all of our fancy thinking down to earth, to one concrete place of incarnation–this bread and this cup of wine! “Eat it here, and then see it everywhere,” he seems to be saying. If it’s too idealized and pretty, if it’s somewhere floating around up in the air, it’s probably not the Gospel. We come back, again and again, to this marvelous touchstone of orthodoxy, the Eucharist. The first physical incarnation in the body of Jesus is now continued in space and time in ordinary food. Eucharist is presence encountering presence–mutuality, vulnerability. There is nothing to prove, to protect, or to sell. It feels so empty, naked, and harmless, that all you can do is be present. The Eucharist is telling us that God is the food and all we have to do is provide the hunger. Somehow we have to make sure that each day we are hungry, that there’s room inside of us for another presence. If you are filled with your own opinions, ideas, righteousness, superiority, or sufficiency, you are a world unto yourself and there is no room for “another.” Despite all our attempts to define who is worthy and who is not worthy to receive communion, our only ticket or prerequisite for coming to Eucharist is hunger. And most often sinners are hungrier than “saints. When peaceful silence lay over all, and when night had run half way her swift course, down from the heavens, from the royal throne, leapt your all-powerful Word. –Book of Wisdom 18:14-15. Max Picard, in his classic book The World of Silence, says, “The human spirit requires silence just as much as the body needs food and oxygen.” As a general spiritual rule, you can trust this: The ego gets what it wants with words. The soul finds what it needs in silence. The ego prefers full solar light—immediate answers, full clarity, absolute certitude, moral perfection, and undeniable conclusions. The soul, however, prefers the subtle world of shadow, the lunar world that mixes darkness and light together, or as the Book of Wisdom more poetically puts it above, “When night had run half way her swift course…”! Robert Sardello, in his magnificent, demanding book Silence: The Mystery of Wholeness, writes: “Silence knows how to hide. It gives a little and sees what we do with it.” Only then will it or can it give more. Rushed, manipulative, or opportunistic people thus find silence impossible, even a torture. They never get to the “more.” Sardello goes on to say, “But in Silence everything displays its depth, and we find that we are a part of the depth of everything around us.” This is so good and so true! When our interior silence can actually feel and value the silence that surrounds everything else, we have entered the house of wisdom. This is the very heart of prayer. When the two silences connect and bow to one another, we have a third dimension of knowing, which many have called spiritual intelligence or even “the mind of Christ” (1 Corinthians 2: 10-16). No wonder that silence is probably the foundational spiritual discipline in all the world’s religions, although it is only appreciated as such at the more mature and mystical levels. Maybe the absence of silence and the abundance of chatter is the primary reason that so much personal incarnation does not happen. Christmas remains a single day instead of a lifetime of ever deepening realizations. Gateway to Silence: Just be. • The trunk of the tree is love. • The core of the tree, that middle part that must be alive for the rest of the tree to be alive, is patience. • The roots of the tree are self-knowledge. • The many branches, reaching out into the air, are discernment. The simplest spiritual discipline is some degree of solitude and silence. But it’s the hardest, because none of us want to be with someone we don’t love. Besides that, we invariably feel bored with ourselves, and all of our loneliness comes to the surface. We won’t have the courage to go into that terrifying place without Love to protect us and lead us, without the light and love of God overriding our own self-doubt. Such silence is the most spacious and empowering technique in the world, yet it’s not a technique at all. It’s precisely the refusal of all technique. Prayer: Listen to the stillness, the language of God. The Spirit that Jesus gives us empowers us to speak. Often when we are expected to speak in front of people who intimidate us, we are nervous and self-conscious. But if we live in the Spirit, we don’t have to worry about what to say. We will find ourselves ready to speak when the need is there. “When they take you before … authorities, do not worry about how to defend yourselves or what to say, because when the time comes, the Holy Spirit will teach you what you should say” (Luke 12:11-12). We waste much of our time in anxious preparation. Let’s claim the truth that the Spirit that Jesus gave us will speak in us and speak convincingly. The opposite of a scarcity mentality is an abundancy mentality. With an abundancy mentality we say: “There is enough for everyone, more than enough: food, knowledge, love … everything.” With this mind-set we give away whatever we have, to whomever we meet. When we see hungry people we give them food. When we meet ignorant people we share our knowledge; when we encounter people in need of love, we offer them friendship and affection and hospitality and introduce them to our family andfriends. As fearful people we are inclined to develop a mind-set that makes us say: “There’s not enough food for everyone, so I better be sure I save enough for myself in case of emergency,” or “There’s not enough knowledge for everyone to enjoy; so I’d better keep my knowledge to myself, so no one else will use it” or “There’s not enough love to give to everybody, so I’d better keep my friends for myself to prevent others from taking them away from me.” This is a scarcity mentality. It involves hoarding whatever we have, fearful that we won’t have enough to survive. The tragedy, however, is that what you cling to ends up rotting in your hands. God is a god of abundance, not a god of scarcity. Jesus reveals to us God’s abundance when he offers so much bread to the people that there are twelve large baskets with leftover scraps (see John 6:5-15), and when he makes his disciples catch so many fish that their boat nearly sinks (Luke 5:1-7). God doesn’t give us just enough. God gives us more than enough: more bread and fish than we can eat, more love than we dared to ask for. God is a generous giver, but we can only see and enjoy God’s generosity when we love God with all of our hearts, minds, and strength. As long as we say, “I will love you, God, but first show me your generosity,” we will remain distant from God and unable to experience what God truly wants to give us, which is life and life in abundance. Text excerpts taken from Bread for the Journey, by Henri J.M. Nouwen , © 1997 HarperSanFrancisco. How do we know about God’s love, God’s generosity, God’s kindness, God’s forgiveness? Through our parents, our friends, our teachers, our pastors, our spouses, our children … they all reveal God to us. But as we come to know them, we realise that each of them can reveal only a little bit of God. God’s love is greater than theirs; God’s goodness is greater than theirs; God’s beauty is greater than theirs. At first we may be disappointed in these people in our lives. For a while we thought that they would be able to give us all the love, goodness, and beauty we needed. But gradually we discover that they were all signposts on the way to God. Rays of Hope – Alleluia! That’s a pretty strong, almost brutal, statement from Jesus. But it makes very clear that there is a necessary suffering that cannot be avoided, which Jesus calls “losing your very life,” or the False Self. Your False Self is your role, title, and personal image that is largely a creation of your own mind and attachments. It will and must die in exact correlation to how much you want the Real. The Real is what all the world religions were pointing to when they spoke of heaven, nirvana, bliss, or enlightenment. Their only mistake was that they pushed it off into the next world. When you die before you die, you are choosing the Real—or union with God—over your imaginary separation from God. You are choosing “the kingdom of God” over your own smaller kingdoms. Heaven is the state of union both here and later. Only the True Self knows that. The lasting question is: “How much False Self are you willing to shed to find your True Self?” Such necessary suffering will always feel like dying, which is what good spiritual teachers will tell you very honestly. You are a son or daughter of the Good and Loving God. The Divine Image is planted inherently and intrinsically within you. You cannot create it, you cannot manufacture it, you cannot earn it, you cannot achieve it, you cannot attain it, you cannot cumulatively work up to it. Do you know why? Because you already have it! That is the core of the Gospel. A preoccupation with False Self gets in the way of experiencing and knowing this reality. The False Self is an imaginary self that thinks it’s separate; it is the self that I think I am. The False Self is what has to die so your True Self can live. God will lead you to that new, transformed place of the True Self if you get out of the way. You don’t have to do it; it will be done to you. Don’t try to engineer your own death. That just reinforces the ego. A situation in your life will lead you to a place, an event, a relationship, a failing or falling apart of something wherein you can’t control life anymore and you can’t understand it. Your little, separate, False Self is simply inadequate to the task. And finally, thankfully, you collapse into the larger self, who you are in God, the True Self, which is inherently beloved. You can’t make yourself more beloved, and you can’t make yourself less beloved. You just have to one day recognize that it is true and start drawing your life from that much larger Source. Our most painful suffering often comes from those who love us and those we love. The relationships between husband and wife, parents and children, brothers and sisters, teachers and students, pastors and parishioners – these are where our deepest wounds occur. Even late in life, yes, even after those who wounded us have long since died, we might still need help to sort out what happened in these relationships. The great temptation is to keep blaming those who were closest to us for our present, condition saying: “You made me who I am now, and I hate who I am.” The great challenge is to acknowledge our hurts and claim our true selves as being more than the result of what other people do to us. Only when we can claim our God-made selves as the true source of our being will we be free to forgive those who have wounded us. When someone gives us a watch but we never wear it, the watch is not really received. When someone offers us an idea but we do not respond to it, that idea is not truly received. When someone introduces us to a friend but we ignore him or her, that friend does not feel well received. Receiving is an art. It means allowing the other to become part of our lives. It means daring to become dependent on the other. It asks for the inner freedom to say: “Without you I wouldn’t be who I am.” Receiving with the heart is therefore a gesture of humility and love. So many people have been deeply hurt because their gifts were not well received. Let us be good receivers. Travelling – seeing new sights, hearing new music, and meeting new people – is exciting and exhilarating. But when we have no home to return to where someone will ask us, “How was your trip?” we might be less eager to go. Travelling is joyful when we travel with the eyes and ears of those who love us, who want to see our slides and hear our stories. This is what life is about. It is being sent on a trip by a loving God, who is waiting at home for our return and is eager to watch the slides we took and hear about the friends we made. When we travel with the eyes and ears of the God who sent us, we will see wonderful sights, hear wonderful sounds, meet wonderful people … and be happy to return home. Are we friends with ourselves? Do we love who we are? These are important questions because we cannot develop good friendships with others unless we have befriended ourselves. How then do we befriend ourselves? We have to start by acknowledging the truth of ourselves. We are beautiful but also limited, rich but also poor, generous but also worried about our security. Yet beyond all that we are people with souls, sparks of the divine. To acknowledge the truth of ourselves is to claim the sacredness of our being, without fully understanding it. Our deepest being escapes our own mental or emotional grasp. But when we trust that our souls are embraced by a loving God, we can befriend ourselves and reach out to others in loving relationships. Choose a word or phrase (perhaps this week’s Gateway to Silence—That all may be one—or simply Be one) as an expression of your intent and desire. Sit comfortably and upright, eyes closed, breathing naturally, and begin to repeat this sacred word silently. As your attention is focused on the desire behind the word, gradually let the word slip away. Rest in silence. When thoughts, images or sensations arise, gently return to the word, a symbol of your consent to God’s presence and action within you. Two periods of twenty minutes each day is recommended for Centering Prayer. To learn more about Centering Prayer, visit Contemplative Outreach. Solitude is the garden for our hearts, which yearn for love. It is the place where our aloneness can bear fruit. It is the home for our restless bodies and anxious minds. Solitude, whether it is connected with a physical space or not, is essential for our spiritual lives. It is not an easy place to be, since we are so insecure and fearful that we are easily distracted by whatever promises immediate satisfaction. Solitude is not immediately satisfying, because in solitude we meet our demons, our addictions, our feelings of lust and anger, and our immense need for recognition and approval. But if we do not run away, we will meet there also the One who says, “Do not be afraid. I am with you, and I will guide you through the valley of darkness.” Let’s keep returning to our solitude. When we feel lonely we keep looking for a person or persons who can take our loneliness away. Our lonely hearts cry out, “Please hold me, touch me, speak to me, pay attention to me.” But soon we discover that the person we expect to take our loneliness away cannot give us what we ask for. Often that person feels oppressed by our demands and runs away, leaving us in despair. As long as we approach another person from our loneliness, no mature human relationship can develop. Clinging to one another in loneliness is suffocating and eventually becomes destructive. For love to be possible we need the courage to create space between us and to trust that this space allows us to dance together. The morality of a mystic is a response to union, not an earning of union. Once you’ve experienced that you’re one with God and your neighbour, why would you steal from him and make his life more difficult? Once you’ve experienced union with your neighbour, why would you lie to him? Or steal his wife? Of course you wouldn’t. But most of us think backwards, “If I don’t lie, God will like me.” No, you’ll like yourself more! God likes you already. That problem is solved once and for all and forever. That’s what every mystic enjoys at ever fuller levels—that you know that you’re loved ahead of time, before death, and unconditionally. And that’s why mystics are happy people. In fact, if they’re not happy, they’re not mystics. If he or she is a “sourpuss” (Pope Francis’ word! ), you know that person is still playing the moral game, which is mostly about willpower, leading to constant failure and disappointment with the self. When we celebrate New Year’s Day, and maybe Easter too, we celebrate a symbolic rebirth of time. We somehow hope for God to do new things with us and for us. We wait for the coming of grace, for the unfolding of Mystery. We wait for the always-bigger Truth. Such humble waiting and open-ended expecting allows us to fall into what Thomas Merton called “a hidden wholeness.” One does not create or hold onto such wholeness (holiness?) consciously—it holds onto us! Our common code word for this hidden wholeness is quite appropriately “God”! When we agree to love God, we are precisely agreeing to love everything. When we decide to trust God, we are also deciding to trust reality at its deepest foundation. But we cannot just wait. We must pray too, which is to expect help from Another Source. Our prayers then start both naming us and defining us. When we hear our own prayers in our own ears and our own heart, we start choosing our deepest identity, our biggest future, and our best selves. We fall into our own hidden wholeness. About ten years ago I volunteered to work over Christmas for the homeless charity Crisis at Christmas and one of my duties was to work in the clothing store. I remember meeting one woman who was very polite – she always said ‘Please’, and when she was given a jumper she would say, ‘Oh, that’s lovely, thank you very much’. She was grateful for more or less anything that I offered her. She was followed by a man whom frankly I found difficult. He just stated – demanded, even – what he wanted: ‘Trousers.’ When asked what size: ‘32 to 34’. When I came back with a pair of trousers, size 32-34, he said, ‘Nah!’ and sent me back to find a different pair. Once I had satisfied him with the trousers, next came, ‘Shoes, size 9’. Back I came with size 9 shoes and he rolled his eyes. Try again. Sometimes he would even tut, and by the time we got to ‘Coat’ I was fairly irritated and annoyed. I found this man rude and ungrateful; he was difficult and hard to like. But this man was on the edge. He was an outsider, excluded from many of the things that we take for granted at Christmas and also in daily life. It was to people like him, not people like me, to whom the Nativity was announced – the excluded and the marginalised, rather than the clerics. It is tempting to have some sentimental, Christmas-card view of the shepherds living in some rural idyll, but the reality is that they were despised. Their work brought them into frequent contact with blood and mess, so they were ritually unclean and unfit to participate in the religious celebrations; they were excluded from participation in Jewish life. And yet it is to these people that the birth of Jesus is announced. ‘The story of the first Christmas is the story of a series of completely unplanned, messy events – a surprise pregnancy, an unexpected journey that’s got to be made, a complete muddle over the hotel accommodation when you get there…Not exactly a perfect holiday.’ This was how Dr Rowan Williams, then Archbishop of Canterbury, described the first Christmas in a Pause for Thought reflection two years ago. He was making the point that each year most of us strive to have the Perfect Christmas: advertisers pile on the pressure, we get carried away with lists and budgets and plans; yet each year seems to bring the same panic and tensions. But perhaps it does not have to be perfect. God does not say to us, ‘Go and get yourself sorted out and then I’ll come, then we will talk’. He comes to the world as it is – imperfect, frequently messy, often muddled. He chose disciples who were far from promising – slow on the uptake, unreliable and obtuse. Matthew gives us Jesus’s family tree and it is one that most of us would keep quiet about: among the kings and prophets there are adulterers, prostitutes and murderers. This Jesus is someone who would have frequent contact with the blood and mess of human existence; indeed, his own life would end in blood and mess. This Jesus can handle chaos and confusion, and he seeks out those who are on the margins, excluded and despised. So for those who feel like one of the outsiders, away from the mainstream and not part of the respectable crowd, there is a special place this Christmas. God shows us, ‘Look, I am in the middle of this and if you would just relax I will help you. It does not have to be perfect. I came here to help you’. As soon as we recognise this, then we may enjoy Christmas a little more and we may find the love Jesus brings at work in our messy, muddled lives; or, even better, we might bring that love into someone else’s mess and muddle. If an imperfect Christmas was good enough for Jesus, surely it is good enough for all of us. I think that we have hardly thought through the immense implications of the mystery of the incarnation. Where is God? God is where we are weak, vulnerable, small and dependent. God is where the poor are, the hungry, the handicapped, the mentally ill, the elderly, the powerless. How can we come to know God when our focus is elsewhere, on success, influence, and power? I increasingly believe that our faithfulness will depend on our willingness to go where there is brokenness, loneliness, and human need. If the church has a future it is a future with the poor in whatever form. Each one of us is seriously searching to live and grow in this belief, and by friendship we can support each other. I realize that the only way for us to stay well in the midst of the many “worlds” is to stay close to the small, vulnerable child that lives in our hearts and in every other human being. Often we do not know that the Christ child is within us. When we discover him we can truly rejoice. Before looking at the text itself, we need to be aware that it comes immediately after all those begts’ (‘Abraham begat Isaac and Isaac begat Jacob, and Jacob…’) in the Prologue that Matthew has given to his gospel. Some people claim, insensitively, that this is the most boring bit of the New Testament; they miss the point that Matthew is making here, for those who know the code (which will have included Matthew’s first listeners). Matthew’s message is conveyed in the three groups of fourteen names into which the genealogy is divided: Abraham to David, David to the Exile, Exile to Jesus. The message is, quite simply, that Jesus is the fulfilment of all of the promises of God, whose fidelity has unfailingly guided Israel all through the painful, and at times sinful, history of God’s beloved people. We need to have that firmly in mind before we listen to the gospel reading this Sunday. In the passage we hear, the first thing to notice is that Matthew connects this episode quite firmly to the first line of his Prologue, using the word ‘genesis’ (which your translation may have as ‘birth’). He is telling us, that is to say, that what we are about to hear is linked to the understanding of Jesus as the climax of Jewish history. That enables us to ride out the shock in the next sentence, which tells us that ‘when his mother Mary was engaged to Joseph, before they had come together, she was found to be pregnant’! In that culture, even more so than in ours, such a thing is not supposed to happen; but while we are digesting the awfulness of it, Matthew gives us relief, telling us that the pregnancy is ‘from the Holy Spirit’. So we know all will be well, even if we cannot at present see how. Now the evangelist lets us into the mind of Joseph: he is facing a major problem. Immediately our sympathies ’ This adjective, and the related noun is a very important idea in s gospel, from whose readers Jesus demanded, notably in the Sermon on the Mount, that their righteousness/justice abound more than that of the scribes and Pharisees’ (5:20). At the moment ‘justice’ is a matter of ‘not wishing to make an example’ of Mary; it must be said that we cannot be quite clear what would have happened if Joseph had made a public fuss about her pregnancy, but it is at least possible that she would have been stoned to death as an adulterer. And so it proves; he is addressed as ‘Joseph, son of David’, which once again picks up the genealogy that we have just read. ‘Son of David’ is, moreover, a title that appears frequently in Matthew, often in connection with healing. Then he gets his instruction: ‘Don’t be afraid,’ (this is a standard address in the Old Testament to those who encounter the divine) ‘to accept Mary as your wife’. Then the reason is given, as the reader is reminded of what we already knew: ‘that which is conceived in her is from the Holy Spirit’. This is followed by a fairly obvious statement, ‘she will bear a child’, and then a slightly less obvious instruction: “and you are to call his name Jesus’. We need to take this instruction seriously; some feminist scholars deprecate the fact that whereas in Luke’s Gospel it is Mary who is to give the name, Matthew gives the task to Joseph. This is not, however, yet another example of a patriarchal society in which the men seize all the privileges that should accrue to the women; something far more subtle is going on here, for in giving the child a name, Joseph is publicly accepting Jesus as his own. So if you were confused about Matthew spending all that time establishing Joseph’s genealogy, when in fact Joseph was not the child’s father, perhaps now you understand. By accepting the boy as his son, and symbolically taking on the father’s role of naming the child, Joseph gives Jesus all his ancestors, regardless of the biological facts. Next, the angel gives an explanation of the name of the child, showing a good understanding of the Hebrew. The name ‘Jesus’ means ‘the Lord saves’, and so it is a small leap to indicate his function: ‘he shall save his people from their sins’. That is what we are to remember throughout the rest of this remarkable gospel. After this, the evangelist offers his own comment, and it is something that he will repeat quite frequently: “this was to fulfil…’. Characteristically, this is followed by an Old Testament citation; if (as seems quite likely) Matthew is in polemical dialogue with ‘the synagogue across the road’, all these ‘fulfilment’ quotations are no doubt meant to support an argument that Jesus is in fact the climax of God’s dealing with Israel through history. In the Sermon on the Mount (5:17), we shall be told that Jesus came ‘not to abolish but to fulfil’. Matthew adds two interesting points. First, he uses the Greek translation of the Hebrew scriptures: where the Hebrew has, ‘a young woman shall conceive’ in Isaiah 7:14, the Greek which Matthew cites has, ‘a virgin’, which fits his understanding that Jesus had no human father. Then, secondly, he adds a translation of the word ‘Emmanuel’, which does not appear in either the Hebrew or the Greek, and is, of course, ‘God with us’, We do not fully discover the importance of this title until we reach the very end of the gospel and hear Jesus tell his disciples, in the light of the resurrection, that ‘I am with you all the days’. It could not be clearer what Matthew means to say here. Then we watch, with some curiosity, to see what joseph’s response will be, and are relieved when he “arose’ (this is a resurrection word in the gospels) ‘from sleep, and did as the angel had commanded him, and accepted his wife’. We may well imagine that there will have been a social cost to this brave obedience: many will have observed that Mary was pregnant when she ought not to be, so they will have regarded Joseph as an accomplice in her apparent immorality. So we should perhaps rejoice that Pope Francis, who has asked that we include Jesus’s adoptive father in the Eucharistic prayer, regards Joseph as a man after his own heart. Like our present pope, Joseph is not afraid to do what God asks, even if there is a price to pay in the shock and horror of Good Religious People. What of us, therefore? How are we to approach the festival that is now just a few days away? Not, I think, by rushing out and enjoying the materialist consumer fest that has dominated the shops for these several weeks now. Instead, the invitation to us is to do whatever it is we are meant to do, regardless of the cost in terms of other people’s esteem. That is the lead that we have been given by the new Bishop of Rome, who is in the process of discovering that if you answer the call of God you will find plenty of people who will rise up in their wrath and criticise you. Watch him, though, and, this Christmas, watch Joseph; and admire the courage of these two ‘just men’ in doing God’s will, whatever the cost. Christmas is not a celebration of the powerful and the mighty; it is a feast of the poor, and of those who know their need for God. Keep your eyes on the prince of peace, the one who doesn’t cling to his divine power; the one who refuses to turn stones into bread, jump from great heights and rule with great power; the one who says, “Blessed are the poor, the gentle, those who mourn, and those who hunger and thirst for righteousness; blessed are the merciful, the pure in heart, the peacemakers and those who are persecuted in the cause of uprightness” (see Matt. 5:3-11); the one who touches the lame, the crippled, and the blind; the one who speaks words of forgiveness and encouragement; the one who dies alone, rejected and despised. Keep your eyes on him who becomes poor with the poor, weak with the weak, and who is rejected with the rejected. He is the source of all peace. Where is this peace to be found? The answer is clear. In weakness. First of all, in our own weakness, in those places of our hearts where we feel most broken, most insecure, most in agony, most afraid. Why there? Because there, our familiar ways of controlling our world are being stripped away; there we are called to let go from doing much, thinking much, and relying on our self-sufficiency. Right there where we are weakest the peace which is not of this world is hidden. Are the great visions of the ultimate peace among all people and the ultimate harmony of all creation just utopian fairy tales? No, they are not! They correspond to the deepest longings of the human heart and point to the truth waiting to be revealed beyond all lies and deceptions. These visions nurture our souls and strengthen our hearts. They offer us hope when we are close to despair, courage when we are tempted to give up on life, and trust when suspicion seems the more logical attitude. Without these visions our deepest aspirations, which give us the energy to overcome great obstacles and painful setbacks, will be dulled and our lives will become flat, boring, and finally destructive. Our visions enable us to live the full life. We must keep this vision alive. Jesus is deeply connected to the earth on which he walks. He observes the forces of nature, learns from them, teaches about them, and reveals that the God of Creation is the same God who sent him to give good news to the poor, sight to the blind, and freedom to the prisoners. He walks from village to village, sometimes alone and sometimes with others; as he walks, he meets the poor, the beggars, the blind, the sick, the mourners, and those who have lost hope. He listens attentively to those with whom he walks, and he speaks to them with the authority of a true companion on the road. He remains very close to the ground. If I am to follow Jesus, then I, too, must remain close to the soil. Often I look up into the clouds and daydream about a better world. But my dreams will never bear fruit unless I keep turning my eyes again and again back to the dust of this earth and listening to what God is saying to me on the road of life. For I am connected to the earth and to all who walk the earth with me. Nature is not the background to our lives; it is a living gift that teaches us about the ways and will of the Creator. This entry was posted in Uncategorized on May 20, 2014 by Mary Kirk. 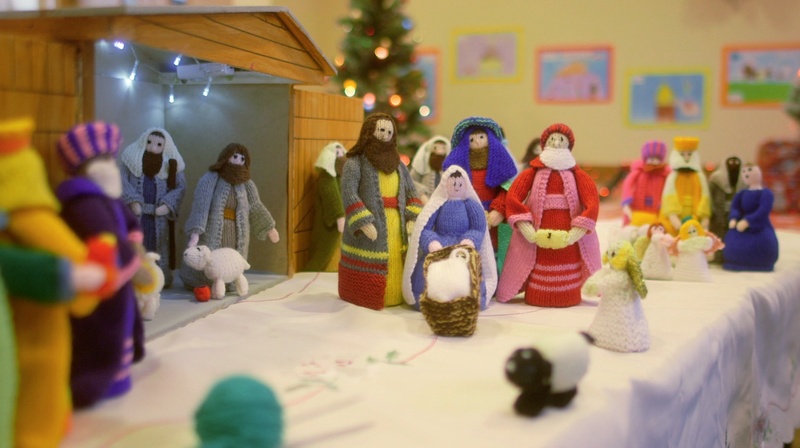 Marino Nativity Knitting Group completed three sets of Nativity figures before Christmas and donated them to the three primary schools – St. Vincent de Paul Infant School, St. Vincent de Paul Girls Schools and Scoil Mhuire Boys School. We also had a great parishioner who made wonderful stables for each crib which can be used for storage and for backdrops when the crib is on display. The group, who only started in Oct, have about 10 members who meet once a month to compare efforts, help each other and chat! We will be meeting in Jan again to plan our next project. A highlight for the group was being filmed by Kairos Communications on Saturday 5th December for the Angelus on RTE over Christmas. This is being shown on RTE 1 at 6pm every second evening from Christmas Eve up to 5th January 2016. 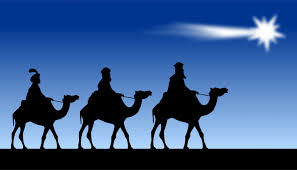 Christmas Carol Concert with Nativity Drama on Mon 21st December 2015 at 7.30pm. 25th anniversary of the opening of St. Maur’s Church, Rush in 1989. Celebration Mass will be offered in the church by Archbishop Diarmuid Martin on Sunday next 31st August at 11.30am. Congratulations to all the children who have received their First Communion recently! This entry was posted in Uncategorized on November 26, 2013 by Mary Kirk.